Contracture of the interosseous, lumbrical, or hypothenar muscles causes the fingers to stiffen and the hand to become deformed and functionally disabled. [1, 2, 3, 4, 5] Intrinsic plus hand is the result of imbalance between intrinsic muscles and comparatively weak extrinsic muscles. The frequency of intrinsic plus hand is not known. The intrinsic plus position is otherwise known as the safe position for hand splinting. The hand can be immobilized in this position for long periods of time without developing as much stiffness as would occur if the digits were positioned differently. In the intrinsic plus position, the metacarpophalangeal (MCP) joints are flexed at 60-70°, the interphalangeal (IP) joints are fully extended, and the thumb is in the fist projection. The wrist is held in extension at 10° less than maximal. The reason why intrinsic plus is the safe position is that in this position, the MCP joints are in flexion and the IP joints are in full extension. 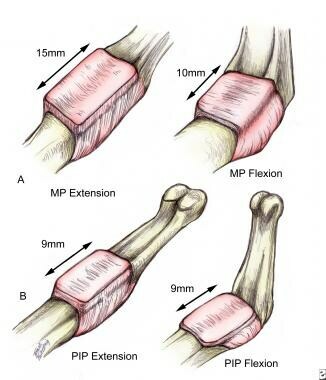 The MCP joints recover well from flexion, and the IP joints recover well from extension on the basis of differences in the shape of the metacarpal head, volar plate, and collateral ligament anatomy (see Anatomy). The metacarpal head is uniquely shaped in that it is ovoid in the sagittal plane, and it widens from the dorsal to the volar dimension. The collateral ligaments are eccentrically mounted dorsal to the axis of rotation of the MCP joint. This anatomy causes variable degrees of tightness on the collateral ligaments based on the position of the joint by a camlike effect. When the joint is in extension, the collateral ligaments are lax. In flexion, the collateral ligaments span a greater distance and are tight (see the image below). The metacarpal head is uniquely shaped in that it is ovoid in the sagittal plane, and it widens from the dorsal to the volar dimension. The collateral ligaments are eccentrically mounted dorsal to the axis of rotation of the metacarpophalangeal joint. This anatomy causes variable degrees of tightness on the collateral ligaments based on the position of the joint by a camlike effect. When the joint is in extension, the collateral ligaments are lax. In flexion, the collateral ligaments span a greater distance and are tight. In addition, the MCP joint is curved in two planes to permit abduction, adduction, and rotation, as well as flexion and extension in an abbreviated ball-and-socket configuration. 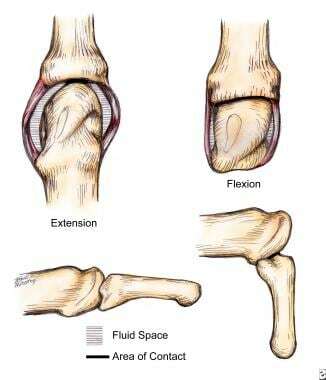 In flexion, bone surface area contact is greater than in extension, producing a more stable joint. Proximal IP (PIP) joint collateral ligaments originate close to the axis of rotation, providing a smaller change in length with joint position and providing lateral stability. The PIP joint ranges in only one plane, and its trochlear shape also adds to its lateral stability (see the image below). Proximal interphalangeal (PIP) joint collateral ligaments originate close to the axis of rotation, providing a smaller change in length with joint position and providing lateral stability. The PIP joint ranges in only 1 plane, and its trochlear shape also adds to its lateral stability. The intrinsic musculature, composed of the interossei and the lumbrical muscles, acts on the hand to flex the MCP joints and extend the IP joints. The interossei also act to abduct and adduct the fingers. There are seven interosseous muscles: four dorsal and three (or four) volar (palmar). These muscles lie on either side of the metacarpals. The dorsal interossei are abductors, whereas the volar interossei are adductors. Each dorsal interosseous muscle, except the one lying on the ulnar side of the middle finger, has two muscle heads, one superficial and one deep. The superficial head originates most dorsally and inserts by way of a medial tendon onto the lateral tubercle at the base of the proximal phalanx. Therefore, the superficial head abducts and weakly flexes the proximal phalanx. The deep head of the dorsal interosseous muscle forms a lateral tendon or lateral band at the base of the proximal phalanx. These lateral bands are joined by the lateral slips of the extensor tendon to form the conjoined lateral band at the level of the PIP joint. The conjoined lateral bands on either side of the finger then join at the distal end of the middle phalanx to form the terminal extensor tendon. The terminal tendon inserts onto the base of the distal phalanx and serves to extend it. Each lateral band at the level of the middle of the proximal phalanx sends off fibers, which arch dorsally to join each other on the dorsum of the finger. These fibers flex the proximal phalanx. Oblique (spiral) fibers also originate from the lateral bands more distally and insert onto the lateral tubercles at the base of the middle phalanx. These oblique fibers extend the middle phalanx. Therefore, the deep head of the dorsal interosseous muscle acts to flex and weakly abduct the proximal phalanx and extend the middle and distal phalanges. The volar interossei each only have one muscle head and form the ulnar lateral band of the index finger and the radial lateral band of the ring and little finger. The hypothenar muscles function similarly to the interossei for the small finger. The abductor digiti quinti (ADQ) function is similar to that of the superficial head of a dorsal interosseous muscle. The flexor digiti quinti brevis (FDQB) functions similarly to the deep head of a dorsal interosseous muscle, forming the ulnar lateral band. The opponens digiti quinti (ODQ) is a third hypothenar muscle that serves to flex and supinate the fifth metacarpal. The lumbrical muscles arise from the flexor digitorum profundus (FDP) tendons in the palm and join the radial lateral band at the middle of the proximal phalanx. The lumbricals extend the PIP and distal IP (DIP) joints and assist in flexing the MCP joints. The IP volar plate is a more rigid cartilaginous structure that does not collapse but glides with movement. 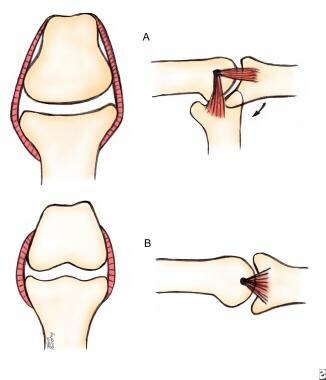 It is attached to the proximal phalanx only by the proximal checkrein ligaments; therefore, the rigid IP volar plate can slide proximally and distally with joint motion to protect the joint (see the image below). Edema is the initial response to any insult to the hand and leads to adverse sequelae. Joint stiffness develops as intra-articular hematoma and fluid accumulate within the synovial space, distending the capsule. Increased fluid content within the articular capsule and collateral ligaments effectively shortens these structures, favoring extension. Edema is the initial response to any insult to the hand and leads to adverse sequelae. Joint stiffness develops as intra-articular hematoma and fluid accumulate within the synovial space, distending the capsule. Increased fluid content within the articular capsule and collateral ligaments effectively shortens these structures, favoring extension. The fluid in the joint space also serves to hydraulically drive the MCP joints into extension. In extension, the joint is able to accommodate this increased fluid capacity. As the MCP joints extend, the flexor tension on the IP joints increases and the extensor tension decreases. This causes the PIP and DIP joints to flex. The resultant late deformity is the intrinsic negative (or minus) hand, consisting of MCP joint extension, IP joint flexion, thumb adduction, and wrist flexion. With injury, checkreins form at the IP joints (see the image below). Checkreins are collagenous bands connecting the lateral sides of the proximal volar plate to the assembly lines on the volar lateral surfaces of the phalanx. Assembly lines are the two ridges along the volar lateral surfaces of the phalanx, to which are attached volar ligamentous structures such as the flexor sheath, the Cleland and Grayson ligaments, and the oblique retinacular ligaments of Landsmeer. With injury, checkreins form at the IP joints. Checkreins are collagenous bands connecting the lateral sides of the proximal volar plate to the assembly lines on the volar lateral surfaces of the phalanx. Assembly lines are the 2 ridges along the volar lateral surfaces of the phalanx to which are attached volar ligamentous structures, such as the flexor sheath, Cleland and Grayson ligaments, and the oblique retinacular ligaments of Landsmeer. 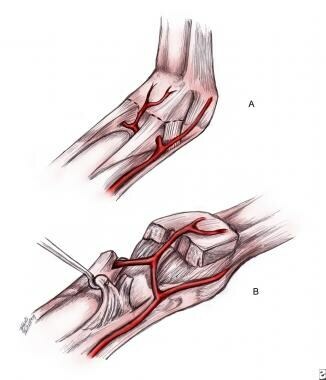 Compartment syndrome is the usual cause of posttraumatic intrinsic contractures owing to edema and ischemia. Hematoma and edema fill the interosseous muscle compartment and are trapped by the firm dorsal and volar interosseous fascia. Capillary compression and venous stasis add to the congestion. As the edema subsides, fibrosis develops. Compressive circular dressings can also impede venous drainage and lead to the development of myostatic contractures in the interossei. Finally, muscle necrosis and fibrosis may ensue with cases of severe and prolonged deep-space edema of the hand. Excessive immobilization, trauma, inflammation, infection, tumor, central nervous system (CNS) disease, and joint destruction are all causes of joint stiffness and intrinsic contractures. [10, 11] Decreased blood supply to the hand as a result of injury or primary disease of the vessels of the upper extremity is a leading cause of intrinsic muscle contracture. The prognosis for each patient is variable and depends on the severity of the contracture and the underlying cause of the contracture. The surgeon's objective is to restore structure and function to the contracted hand. The ultimate goal is to provide the patient maximal comfort and functional independence. Tosti R, Thoder JJ, Ilyas AM. Intrinsic contracture of the hand: diagnosis and management. J Am Acad Orthop Surg. 2013 Oct. 21 (10):581-91. [Medline]. Wong JM. Management of stiff hand: an occupational therapy perspective. Hand Surg. 2002 Dec. 7(2):261-9. [Medline]. Revol M, Servant JM. [Paralysis of the intrinsic muscles of the hand]. Chir Main. 2008 Feb. 27(1):1-11. [Medline]. Liss FE. The interosseous muscles: the foundation of hand function. Hand Clin. 2012 Feb. 28 (1):9-12. [Medline]. Valenzuela M, Varacallo M. Anatomy, Shoulder and Upper Limb, Hand Interossei Muscles. Treasure Island, FL: StatPearls; 2018. [Full Text]. Bowers WH, Wolf JW Jr, Nehil JL, Bittinger S. The proximal interphalangeal joint volar plate. I. An anatomical and biomechanical study. J Hand Surg Am. 1980 Jan. 5 (1):79-88. [Medline]. Ling MZ, Kumar VP. Myofascial compartments of the hand in relation to compartment syndrome: a cadaveric study. Plast Reconstr Surg. 2009 Feb. 123(2):613-6. [Medline]. Formsma SA, van der Sluis CK, Dijkstra PU. Effectiveness of a MP-blocking splint and therapy in rheumatoid arthritis: a descriptive pilot study. J Hand Ther. 2008 Oct-Dec. 21(4):347-53. [Medline]. Pitts DG, O'Brien SP. Splinting the hand to enhance motor control and brain plasticity. Top Stroke Rehabil. 2008 Sep-Oct. 15(5):456-67. [Medline]. Watanabe Y, Iba K, Taniguchi K, Aoki M, Sonoda T, Yamashita T. Assessment of the Passive Tension of the First Dorsal Interosseous and First Lumbrical Muscles Using Shear Wave Elastography. J Hand Surg Am. 2019 Feb 26. [Medline]. Paksima N, Besh BR. Intrinsic contractures of the hand. Hand Clin. 2012 Feb. 28(1):81-6. [Medline]. Espiritu MT, Kuxhaus L, Kaufmann RA, Li ZM, Goitz RJ. Quantifying the effect of the distal intrinsic release procedure on proximal interphalangeal joint flexion: a cadaveric study. J Hand Surg Am. 2005 Sep. 30 (5):1032-8. [Medline]. Lansmeer JMF. The anatomy of the dorsal aponeurosis of the human finger and its functional significance. Anat Rec. 1949. 104:31. Hamada Y, Sairyo K, Hibino N, Kobayashi A. Correction of Severe Contracture of Intrinsic Plus Hand with a Modified Ilizarov Mini-Fixator: Correction with an Ilizarov Mini-Fixator for Severe Hand Contracture. J Hand Microsurg. 2015 Jun. 7 (1):161-5. [Medline]. [Full Text]. Smith RJ. Surgery of the hand in cerebral palsy. Pulvertaft RG, ed. Operative Surgery: The Hand. 3rd ed. London: Butterworth; 1977. 215. Lannin NA, Cusick A, McCluskey A, Herbert RD. Effects of splinting on wrist contracture after stroke: a randomized controlled trial. Stroke. 2007 Jan. 38(1):111-6. [Medline]. Smith RJ. Intrinsic muscles of the fingers: function, dysfunction and surgical reconstruction. AAOS Instructional Course Lectures. St Louis: Mosby; 1975. Vol 24: 200-20. Thevenin-Lemoine C, Denormandie P, Schnitzler A, Lautridou C, Allieu Y, Genêt F. Flexor origin slide for contracture of spastic finger flexor muscles: a retrospective study. J Bone Joint Surg Am. 2013 Mar 6. 95(5):446-53. [Medline].